The civilization was formed as early as 1500 BC. About AD 300 to 900 the major ceremonial centers including Palenque, Tikal, and Copán were mysteriously abandoned. 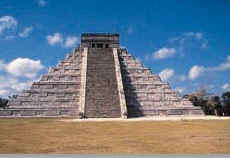 The Mayan religion centered around the worship of many nature gods. Their amazing architecture remain as great ruins at centers they used for religious ceremonies, including Palenque, Uxmal, Copán, Tikal and Chichén Itzá.